The recent Horizon programme “What’s Killing Our Bees” shown on BBC2 and available on BBC iplayer for a few weeks yet (and Youtube - http://www.youtube.com/watch?v=DYr_xREfC8E) looked into why bee’s across the world are disappearing at an alarming rate. Lots of theories have been put forward: pesticide use, change of farming techniques, over farming (bees in the US are shipped coast to coast and don’t have a period of rest to rebuild their strength), disappearing habitat thanks, in part to Councils being over tidy with verges, disappearing hedgerows and single farm crops creating too much of a mono-culture), climate & weather changes and the varroa mite etc, etc. Horizon looked into all of these and concluded what a lot of us have already started to think, mainly that no one cause can be blamed and it is a culmination of them all that is weakening bees and leaving them too weak to fight any of them. I found it a very informative programme and well worth a watch, especially because it doesn’t just concentrate on the well known honey bee but all pollinators such as Bumblebees, solitary bees and hover-flies as well. The programme not only highlighted the rapid decline of pollinators but also showed some places that are surprisingly bucking the trend, with bees that are flourishing and producing great honey. You may be surprised to read these are cities such as Birmingham and Paris where there appears to be a greater diversity of plants (we would probably call them weeds!) as well as gardens and parks where pesticide usage is lower. It also showed that some farmers are starting to create wildlife corridors around (and sometimes straight across) their fields to introduce a variety of bee friendly plants to join up the woodlands and generally give them more of what they like. The hope is that this will enable them to get the nectar they need without having to work as hard resulting in stronger bees that are better able to cope with all the other things that are affecting them. - plant bee friendly plants in our gardens and on our allotments making sure we provide flowers for all times of the year for when the bees hatch or come out of hibernation in the Spring, throughout the summer to feed their colony’s (or lay their eggs in the case of the solitary bees) and during the Autumn so they can build up the reserves they need to survive the Winter. The thing to be wary of with summer bedding plants is to avoid the F1 hybrids that are often sterile and no use to pollinating insects, going for plants like antirrhinums, buddleia and forsythia etc. 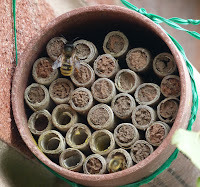 - There are over 200 species of solitary bee in the UK alone, from mining bees, which make their nests in the ground, mason bees that will inhabit any nook and cranny they can find and leaf cutter bees to name but a few. - One mason bee can do the job of 120 honey bees when it comes to pollinating apple blossom (another reason to encourage them into your garden or allotment). 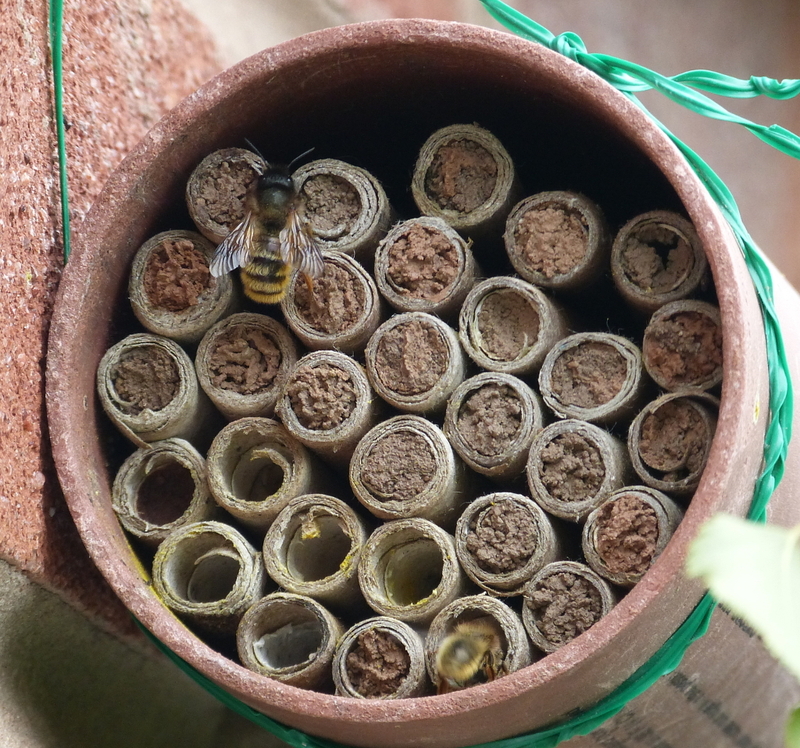 - Solitary bees are very placid insects and no danger to either children or animals so a fantastic way of teaching children about nature and helping encourage pollinators. - Bees are responsible for pollinating a third of the crops we eat. If you have any comments or questions why not visit the Wiggly Wigglers Facebook group and join in the (very) active discussions on nature, composting, gardening and wildlife in general.